Life onboard a side trawler was like no other! A typical crew on a Granton/Leith side trawler was 12/13 men (crew size could depend on the fishing ground). Skipper, Mate and 2nd fisherman being certificated watch keepers. Engine Room: - Three watches = Chief Engineer, 2nd Engineer and Greaser. On most trawlers the Skipper, Mate and Chief Engineer had a cabin to themselves. The rest of the crew shared a main cabin under the galley (this held six to eight bunks) with a table in the middle of the cabin surrounded by cushioned benches. 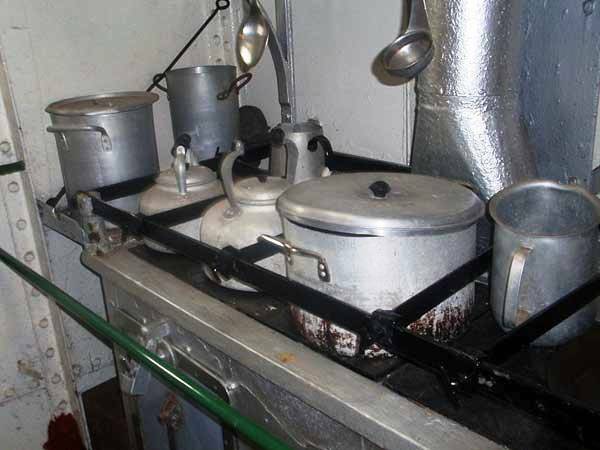 A separate two man berth was usually occupied by the cook and second engineer, some trawlers had a couple of banks aft at deck level. On steam trawlers there was usually accommodation for eight under the forecastle, the Skipper, Mate and engineers all sleeping aft. It was particularly uncomfortable forward in the forecastle as this took the brunt of the waves. In those days few trawlers had forecastle decks or whalebacks to break the force of the waves coming onboard. This also made life on deck hazardous; the forecastle accommodation would get flooded out frequently in poor weather. 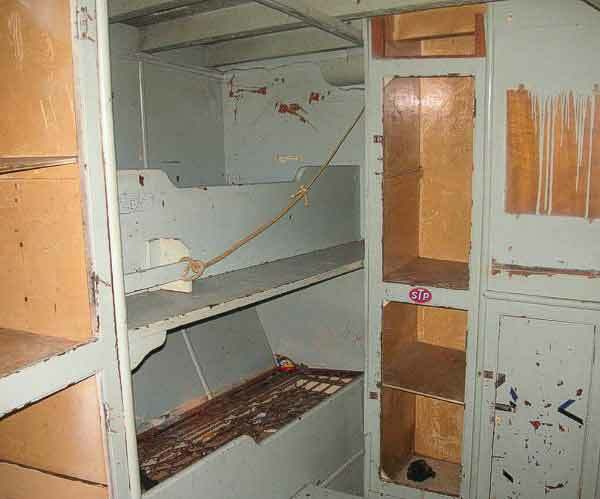 The only way aft from the forecastle to the mess deck or wheelhouse was along the deck. Beds (approx 180cms x 80cmsx80cms) on most trawlers were nearly always damp and the cabin soon smelled of damp when the heating was extinguished. The smell was at its worst on sailing days after everything had been shutdown whilst in port. Mattresses known as “Donkeys breakfasts” were stuffed with things like straw, kapoc and some were just a block of foam. The crew slept with their clothes on, the stench could become unbearable. Once the fishing grounds had been reached and the net shot over the side the watch system changed. The 2nd Fisherman was responsible for tying the Cod-End and for controlling the winch when hauling and shooting assisted by the Greaser. The Greaser only went down the engine room to do meal reliefs. He also looked after all on deck lubrication, of Sheaf's and blocks. The Gutter relieved the Skipper for his meals (depending on shipping in the area). He was also responsible for looking after the net store. The net would be trawled along the sea bed for between 1 - 4 hrs depending on the amount of fish being caught. Too much fish could cause the cod end to chaff on the seabed and create a hole. The length of this dependant on how much fish was being caught. Sometimes the net was hauled again before gutting had finished, the older fish being transferred to the other side of the deck. A man could wait two days before he got his watch in. After hauling in the net, the Cod End would be emptied, re - tied and the net shot over the side again. 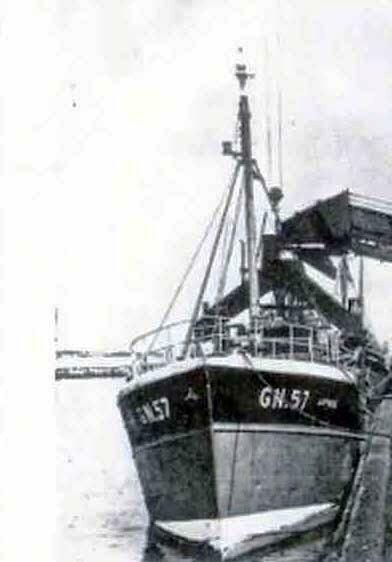 (Prior to 1960'ish trawlers had gallows, doors and nets on the Port side. This net would be shot if the Starboard side was damaged.) The Starboard net would then be mended before any fish were gutted. Unlike other ports there were no set meal times in Granton; cooks did a marvellous job to have the food ready as the men left the deck. Cooks were very flexible and most even gave a hand at gutting during periods of heavy fishing as did some engineers in their time off. Any meat carried was stored in the fish room on top of the ice to keep it fresh as few trawlers had fridges. In winter the cook had to plan ahead as the only way into the fish room was by the deck hatches, these would be battened down during severe weather. It is amazing that these cooks managed to anything given the small space allocated for cooking and the motion of the boat. While the fish was being gutted and washed the Mate would be in the fish room preparing ice and boxes for the fish. The 2nd fisherman was left in charge of the deck in the Mates absence. Fish would be gutted and placed into baskets depending upon size. Cod = Cod, Spraggs, Large Codling, Medium Codling and Small Codling. Most other fish were large, medium and small. Once gutted the baskets of fish were washed by the Deckie Learner and lowered by a rope and hooks by the Greaser into the fish room were the Mate boxed and iced them according to size. If large fish were being caught the 2nd Fisherman would assist the mate in the fish room. The crews on steam trawlers did not have rubber gloves available so in heavy fishing of “Spawny Huddies" many a man had very painful and raw joints between the fingers, not unlike athletes foot. Steam Trawlers carried extra coal on deck to ensure they had enough fuel; this would be shovelled off the deck down the stokehold by the trimmers on the way out to the fishing grounds. On the steam trawlers the trimmers had to haul up ashes from the boiler and tip them over the side on a daily basis. The time left between finishing gutting and hauling the net was all the sleep / free time a person had if not on watch. On the way home weather permitting, nets would be mended and got ready for the next trip, the ship would be scrubbed down from stem to stern. On steam trawlers after landing they had to go to the bunkering berth, at the end of the Middle pier under the "Trouser Legs". These were two large steel tubes in the shape of a pair of trousers which were hoisted by crane to straddle the super structure of the trawler and allow the coal to be poured into the ship's bunkers on each side of the trawler from railway wagons on the pier. The wagons were lifted and turned upside down pouring the coal into a large hopper which fed a conveyor belt that took the coal up to the top of the trouser legs. As you can imagine there was coal dust everywhere. Each boat had to be booked in to "coal" so that the wagons could be shunted down to the coaling berth making the point of the pier a very busy place. Having coaled, the boat was washed down from stem to stern, the bunkers trimmed and the crew could then go home. Depending on how long you had been away would govern how many days ashore you got. Double landing = landing day + settling day(2 trips) + two clear days. All other work carried out in harbour was done under the command of the Ships Husband who allocated work to contractors and dealt with re stocking the cook’s stores etc. On sailing days the crews would come down to the ship at about 10.00hrs and hang around chatting to friends from other trawlers. Some would go for a last drink in The Tap (Granton Tavern) the Ships Runner would spend half his time chasing these men down to the boats. The Ships Runner would have a couple of men on pay to stand by and fill in at a minutes’ notice for anyone who did not show up. Although most spent Christmas at sea all would be home for the New Year festivities. * Skippers cabin and day room was attached to/under the Wheelhouse.